Jason Christie had buddies on the water watching him fish all week and had his family to celebrate with him after it was over. When the 2013 FLW Tour schedule was released and it included a June event at Grand Lake O' The Cherokees, Jason Christie thought for sure it'd be won out away from the bank. He wasn't alone in his reasoning. Many others came prepared for an offshore derby last week, but heavy rains brought the lake way up, flooding thousands of acres of buck brush and willows. In the end, it turned into an old school, power-fishing flip fest, the kind Christie seems to excel at. Heck, these days, there's not much the Park Hill, Okla., native doesn't do well. 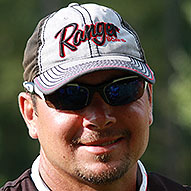 He's made a recent habit of winning tour-level events and the Grand Lake triumph marked his third victory of the season and catapulted him back to the No. 1 spot in the BassFan World Rankings presented by Livingston Lures. "They all have their place," he said when asked to rank his victories this year. "Beaver (Lake) was special because well, it's Beaver and that's the kind of fishery people wouldn't expect me to win at. Then to win an Elite Series (Bull Shoals Lake) against those guys was a special thing. This one might be the most special, though. It's hard to win on your home lake. I don't care if you're Kevin VanDam in Michigan or Terry Scroggins in Florida, it's hard to win. All of the pressure's on you." He said one thing that tripped him up when he finished 7th at the Bassmaster Classic at Grand back in February was that he got caught up running around to spots where he'd caught them before at the same time of year or in similar cold conditions. Last week, he fished memories again. This time, though, he set up camp in the Elk River and barely budged. He burned very little fuel and picked apart a flooded island that drew wads of fish to it when the water came up. Once the water stabilized and began dropping slightly, it put the fish on the edges and consequently right in his crosshairs. He opened with a tournament-best 21-12 on day 1, but his weight dipped 3 pounds on day 2 and another pound on day 3. He rocked 19-13 on Sunday to win by more than 5 pounds over Bryan Thrift. Despite sharing water with Andy Morgan, who wound up 7th, he proved there were plenty of quality fish to go around. 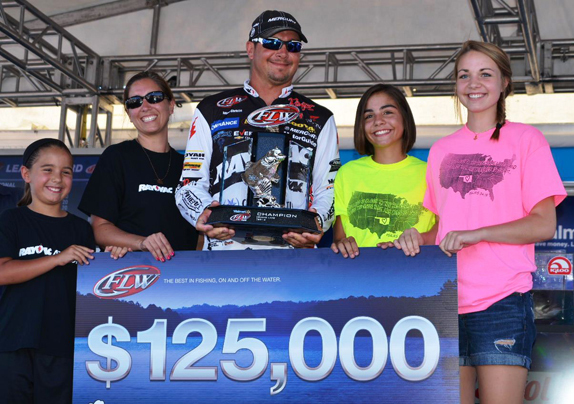 "I really wanted to fish deep because I thought it was my best chance to win," he said. "Looking back on it, it would've put a lot of people in a few areas. With the water coming up, it came up real fast and it took the fish a while move in. I think they really moved in on the off day (Wednesday) and when it started to slowly come down, all that did was replenish the fish." With so much rain falling during practice, it was hard to tell where the water would rise to as it had the post-spawn fish scattered pretty well. Those who tried to get something going out deep quickly realized the swarm of boats beating the bank probably had the right idea. Christie was no different, but he knew enough not to waste an inordinate amount of time out deep. "To illustrate how bad my practice was, on day 1, I started in a place I thought I could catch 10 pounds," he said. "Then I figured I'd go practicing again. I went in there to catch 10 pounds and caught two keepers and a 5-pounder, then I went to the Elk River. There's no place on the lake I had more confidence in than there. I caught a fish or two on a few places on the way back in, but 95 percent of the fish I weighed were caught in the Elk." With the Grand River Dam Authority (GRDA) siphoning a lot of water out of the lake on day 1, there was a good amount of current moving through the system and Christie said much of his game plan was dependent on the generation schedule. With the water up in the bushes and muddy, he headed up the Elk River, which typically holds cleaner water by comparison. Clarity wasn't the draw for him, though. About 10 years ago, he fished a team tournament at Grand under similar conditions around the same time of year. He and his partner fished the Elk that day and nearly won the derby. "What separates that place from lot of the rest of the lake is it has a big bay with an island in it," he said. "It can be overwhelming for a lot of guys because there's really no place to start or end. "I told (Andy) Morgan I've been fishing up there for 20 years and it took me a long time to figure out that this place is the juice. It's the only area in the river that has a bunch of cover like that. It's real wooly." He crushed a tournament-best 21-12 to open the event, catching a couple weigh fish on a frog before picking up his flipping rod. "We went through there on day 1 and cleaned them out, then the water came down and that drew them out to the outside edge," he added. The water level began to stabilize on day 2 and he stuck 18-14 as his lead grew to more than 2 1/2 pounds over Robbie Dodson. With the water leveling off, it allowed the fish to get settled in and made them easier to target, but execution was a challenge around the gnarly limbs, logs and other submerged obstacles. "I lost a couple of fish, but never saw them," he said. "I didn't think they were giants, but I caught some fish last week that I shouldn't have caught so it all evens out." He boated 17-10 on day 3 for his smallest limit of the event, but it helped him carry a 3 1/2-pound advantage into the final day over Barry Wilson. 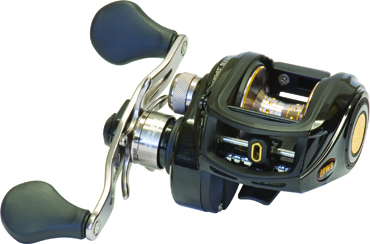 The Lew's Speed Spool BB1 was Christie's go-to reel when it came to flipping the thick brush and willows in the Elk River. He lost a big one right away on the final day and was worried it would be a harbinger of things to come. Instead, he capitalized on a mid-day flurry and put it out of reach with a 4-pounder with less than 2 hours left. "I figured it out day to day," he said. "Some days, it was based on water flow and some days they were on the points and other days they were way back in the stuff. I fished really slow all week. I had to cover everything and I think that's what helped me. I didn't go through it real fast. When I got to my area on day 4, I never fished the same stuff twice even though it wasn't that big of an area. "I only ran around a little crazy on day 3, but I was trying to let my co-angler catch a couple. Overall, I didn't burn very much gas. This was pretty cool, though. I did it in a way that is the reason I like to flip. It was close contact, old-school flipping. I caught them flipping at Smith Lake earlier this year, but I'd only get five or 10 bites a day. Here, guys were talking on day 4 about getting 50 bites � on the 4th day! It was a lot of fun. My hands and knees are all scarred up from being on the front deck and landing so many fish. It was an awesome week." > Entering the tournament, Christie figured someone would pop a limit in the 23- or 24-pound neighborhood, but with the water so dirty and slow to clear up, he thinks it took a lot of post-spawn females out of play. "With the late spawn, I think a lot of the females had already moved out and they just weren't catchable," he said. "The water clarity wasn't conducive. What people don't realize is a lot of those 3- to 4-pound fish we caught were males. I've seen hundreds of pairs of fish up shallow here with a 4-pound male and a 5-pound female. Grand just has a ton of fish like that." > He estimated the area he fished all week to be about 100 acres and it was chock full of targets. The deepest fish he caught during the event was in about 5 feet of water. "There's a lot of stuff to fish and if you wanted to fish it all, it would take you from daylight to dark," he said. "You could sit out in the middle and see it all." He said the key was employing the same technique he used 10 years ago in the local team tournament. "I figured out a pattern that day which is what I used this week to win," he said. "You could flip your bait in there and let it go to the bottom and get bit now and then. I likened it more to flipping in Florida. You'd flip in there and let it go to the bottom, but I'd bring it up quickly to the limb or log and just shake it. That just drove them crazy. As soon as it went in the water or when I'd bring it up to the limb is when they'd take it. It was something I figured out in the same place at the same time of year. "I also saw that day how many big fish that lived there. The island makes it a special place. It's about 500 yards long and maybe 75 to 100 yards at its widest point. When the lake comes up, it's not an island anymore. It's just a big grove of trees and the fish move in there. As the water starts coming down, they start pulling out to the outside. Every day with the water coming down, it just pushed more fish out to me." > Frog gear: 6'11" heavy-action Falcon Cara T7 Jason Christie Signature Series frog rod, Lew's Super Duty casting reel (7.1:1 ratio), unnamed 50-pound braided line, BOOYAH Poppin' Pad Crasher Frog (dart frog). > Flipping gear: 7'3" heavy-action Falcon Cara T7 swimbait rod, Lew's Speed Spool BB1 casting reel (7.1:1 ratio), 25-pound Silver Thread fluorocarbon line, unnamed 1/2-oz. flipping weight, 6/0 Lazer TroKar flipping hook, YUM Wooly Bug (green-pumpkin purple). > He also flipped a creature bait later in the event. > Main factor in his success � "Having confidence in the Elk River. In practice last week, I had two 4-pound bites up the Elk." > Performance edge � "My Power-Poles. That was the deal. I had a spectator on the second day tell me that he's lived on Grand for years and never thought he'd need Power-Poles, but after watching me he said, 'Now I see why I need them.' They were up and down 100 times today. I caught a lot of fish with those poles down. The other thing, too, is when you were up in the willows, they'd act as natural limb deterrents to keep the willow branches off your engine." > Christie said he'd been trying to convince FLW to stage a tournament at Grand for several years. "I'd been on (tournament director Bill) Taylor to get FLW to come here just because I wanted to show the lake off," he said. "I know the Elites did it with the Classic and I wanted FLW to do it. The flip side of having a tournament so close to home is all the pressure you put on yourself. I hope they come back and I think they will. Grove is starting to make a big push to have some big tournaments and I think you'll start seeing a (Bassmaster) Open or an EverStart (Series) or a tour event here every year."